Lahore (Press Release): AlHuda Center of Islamic Banking & Economics (CIBE) wins the award of best Islamic Finance Education Provider according to which, AlHuda has been awarded for spreading the best education of Islamic banking & finance for the year 2015/16. 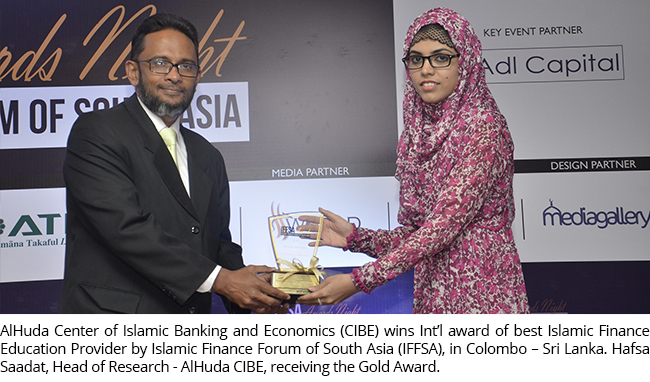 The award ceremony was held in Colombo, the capital of Sri Lanka under the supervision of Islamic Finance Forum of South Asia (IFFSA) in which the CEOs of banks, representatives of central/commercial banks and the delegates related to Financial and Capital market participated from more than 15 countries. It is also observed that, According to 2015 report of ICD - Islamic Development Bank, AlHuda CIBE ranked at 1st position in organizing seminars/Trainings globally for Islamic Banking and Finance industry, while ranked in 3rd position in organizing the conferences of Islamic Banking & Finance. Hafsa Saadat, Head of Research & Product development, AlHuda CIBE while addressing to the audience of the award ceremony said that it is a great honor for AlHuda CIBE and it symbolizes that any institution can be introduced on international level with its hard work and honesty. She further added that it was not any easy task to achieve this award as there was a great competition among different international institutions. Muhammad Zubair Mughal, the Chief Executive Officer, AlHuda CIBE stated that it is the result of hard work of the AlHuda team and he congratulates his team on this great achievement. He narrated that AlHuda has organized more than 1000 educational & capacity building programs in more than 40 countries including USA, UK, Germany, France, Japan, Nigeria, Tanzania, UAE, central Asia countries, and Russia etc. during the last eleven (11) years. He said that AlHuda CIBE has the honor of organizing the most training & capacity building programs around the world, not only this but AlHuda has also established many Islamic Banks, Takaful Companies, Islamic Fund and Islamic microfinance institutions by providing its advisory & consultancy services in different countries. 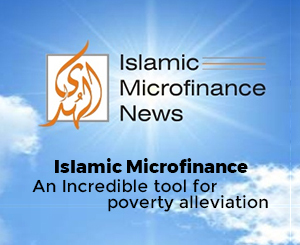 AlHuda CIBE also have different online programs of Islamic banking, Islamic Fund, Takaful, Halal Industry & Islamic Microfinance in different languages. Which are subscribed by professionals from more than 65 countries from all continents.